The Ghanaian GLO Premier League 2011-2011 was finalized on 27.05.2012. Based on matches I’ve seen, reports I’ve read and hearsay from contacts, I have picked my “Team of the season”. * Last season, veteran goalkeeper Soulama played only three matches for Asante Kotoko FC. This season, Soulama, who will turn 38 later this year, has been first choice, playing 24 matches. MTN Football recently wrote that Soulama conceded 12 goals in 26 matches. In any case, Soulama deserves a lot of credit for Kotoko’s defensive record, the second best in the league. Soulama, who recently was yet again picked for the Stallions, the Burkina Faso national football team, is a very confident goalkeeper with plenty of experience. I’m impressed with Soulama’s ability to pick out crosses and despite his relatively high age, he is an excellent shot stopper. Soulama played professionally for Denizlispor (Turkey) during the seasons 2000-2001, 2001-2002 and 2002-2003. * After an unsuccessful stint in Libya for Al-Ittihad Club Tripoli, Boateng returned to Ghana and Berekum Chelsea FC. From Week 7, Boateng has been first choice at left-back and his performances have been consistent and highly impressive. Boateng is a disciplined player with bravery and aggression. He loves to join the attack on overlapping runs. Boateng, who scored one league goal during the season, broke through at Liberty Professionals FC. * Strong as a bull, tough in the tackles and almost impossible to beat in the air. Godwin Osei Bonsu, the captain of Hearts of Oak SC, has arguably been the top performer at the Phobians. Bonsu scored two league goals during the season. * I guess most experts would rate Mohammed Awal as a better player than Henry Ohene Brenya, his partner in the central defence of Asante Kotoko FC. That could very well be, but from my point of view, Brenya has been somewhat more consistent. I love the quiet, effective performances of the Kokoto-captain. Brenya rarerly causes any headlines but he is always playing with the heart on his sleeve. Brenya was a key player for Berekum Arsenal FC before joining Kotoko before the GLO Premier League 2010-2011. Brenya did not score any goals during the current season but as far as I know, he was ever present in the heart of the defence for the league champions. * It’s no secret that I’m a big fan of the impressive right-back Godfred Saka of Aduana Stars FC. Saka, an expert from set pieces, rather sensationally became top scorer of the team with six league goals. Saka is known for his cultured right-foot, his dangerous free-kicks and crosses and his tireless work up and down the right side. Saka is one of these fabulous West African full-backs with heavy emphasis on attack. Saka has great stamina combined with power and intelligence. * On 29.02.2012, petit winger Richard Mpong made a goalscoring debut for the Black Stars, the Ghana national football team, in a friendly match against Chile. Mpong, a former player of Gamba All Blacks FC and Kessben FC, is a very exciting player to watch, known for his dribbling skills, pace and good passing ability. Mpong is not a typical goalscorer (he scored only once during the season) but his crosses, especially towards pointmen Louis Agyemang and Hans Kwofie, are valuable to the attacking play of Medeama SC. Medeama SC has been a disappointment this season but Mpong has been wonderful in several matches. Mpong can play both at left-wing and right-wing. * From my point of view, Akuffo is one of the easiest picks. The box-to-box midfielder has been simply brilliant in the center of the park. Akuffo is a dynamic, hard-working player with both defensive and attacking qualities. His stamina, tackles and passes are top-shelf. Akuffo is a product of the Feyenoord Academy and has also played for ASEC Mimosas in the Ivory Coast. In 2009 and 2010, Akuffo played for Finnish second level side FC PoPa. Akuffo has almost been ever present this season and has scored four league goals. * Moro, a midfield workhorse, has developed into a key player for Hearts of Oak SC. Moro has primarily defensive responsibilities and his hard work is fundamental for the balance of the team. Moro is reportedly on the radar of several clubs in Ghana, including Medeama SC and Berekum Chelsea FC. If Moro is able to develop his creativity and passing ability, he will become a quality player. As far as I know, Moro has only missed one match all season. He has not scored any goals. * Hard-tackling midfielder Attobrah has been one of the revelations of the season. Most sources will say that Attobrah is only 17 years old and despite his young age, he has actually been captaining Edubiase during the season. Attobrah has been described as a player who has “a gift for recycling possession and dictating the pace undimmed”. Personally, I have always liked his tireless work and aggressiveness. Attobrah is also a player with attacking qualities, having scored three league goals during the season. According to some rumors, Attobrah will shortly join Asante Kotoko FC. Attobrah, arguably one of the most interesting prospects in the league, has been part of the Ghana U-17 and the Ghana U-20 national football team. Attobrah can play both as a central midfielder and a right-winger. 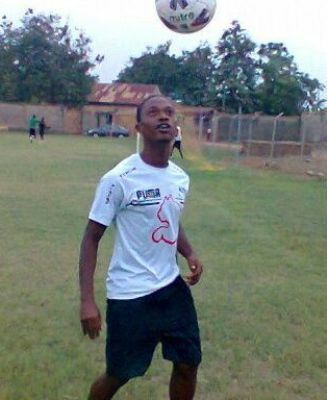 The picture is of Attobrah and was found on Ghanasoccernet. * Baffour is a rather obvious choice for the team of the season, especially since he was named as “Premiership Player of the Year” by the Sports Writers Association of Ghana. Baffour scored an incredible tally of 21 goals in about 25 matches for the rather modest side New Edubiase United FC, making him top scorer in the GLO Premier League 2011-2012. It’s been a fairytale season for the sharp-shooting striker, known for being an all-round player with no particular weaknesses. Baffour is strong, fast and skillful, with decent dribbling abilities. Baffour made his debut for the Black Stars, the Ghana national football team, during the season. Former clubs include Liberty Professionals FC and Tema Youth FC. Baffour will most likely play in a bigger league next season. According to unconfirmed sources, New Edubiase United FC will sell their star player for USD 1 000 000. * Burly striker Mohammed, known for his physical strength and his direct style of play, is one of my favourite players in the GLO Premier League. This is the kind of player who is able to form an attack practically on his own. Mohammed had a difficult start to the season, scoring only once in his 10 first matches. However, from Week 12 to Week 30, Mohammed scored 15 goals, making his total record for the season an impressive 16 goals. I think Mohammed deserves a chance in a bigger league. Can u provide contact details to discuss the players.